What do we have here, hiphoptrooper? 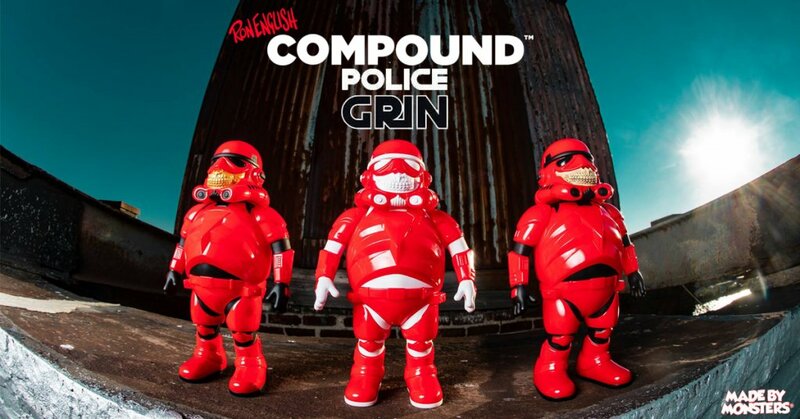 Nar it’s our fam at the COMPOUND exclusive version of “Police Grin” by Ron English x Made By Monsters. COMPOUND are preparing to stock the streets with heavy protection by unleashing COMPOUND Police Grin this FRIDAY. 3 versions have been teased which feature Bone, Gold and white GRINS. Whos GRINNING NOW? Bet your bank account isn’t. Compound strikes again. This time, a Star Wars-themed toy collaboration with Ron English and Made By Monsters is set to release on Friday, August 3, 2018 at 12 pm EST. Releasing three red spin-offs of English’s “Police Grin’. 500 ‘Compound Police Grin’ toys will be available in a polished red with varying details marking each adaptation.